Fear Free is an initiative undertaken by veterinary practitioners nationwide. Their mission is to prevent and alleviate fear, anxiety, and stress in pets when encountering a variety of situations—the animal hospital, the groomer, or—in your case—the shelter. 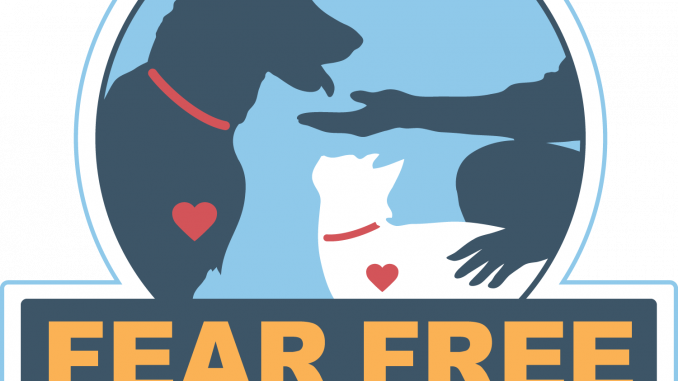 This practice has been a remarkably transformative initiative in veterinary practice—over 25,000 veterinary and pet professionals have committed to becoming Fear Free certified. Fear Free is centered on the idea of making the veterinarian a stress-free place. Practitioners reduce/remove anxiety triggers that may catalyze fear at home, during transport, and at the veterinary hospital. The certification is also geared toward enhancing the quality of medicine practiced and increasing compliance, thus improving safety for the entire veterinary staff. By implementing basic practices, such as escalating treat rewards and in-room anxiety-reducing sprays, dogs may come to enjoy what are usually considered to be stressful places. In order to achieve this certification, veterinary and pet professionals must complete a series of online modules, which instruct on certain practices to implement in your handling of animals. Becoming a Fear Free Certified Professional also allows unlimited access to the Fear Free Educational Library and Toolbox (downloadable marketing tools, drug charts, &c), access to a private Facebook group, a free, informative podcast subscription, and additional RACE approved CE courses at discounted rates. Though Fear Free certification is intended, primarily, for veterinary practitioners, implementing certain aspects of the program may greatly improve the wellbeing of the dogs in your shelter. Additionally, certification allows the use of their logo in the shelter and on apparel and advertising your shelter as a Fear Free certified location is a great way to attract potential forever homes. For more information about the certification, visit their site. Shelter or Rescue: Which Are You?